DELETE THIS NOW! : Should Stefflon Don apologise for her old tweets? Sunday evening, I returned home from working Chris Rock’s show at The 02 Arena. Chris Rock, arguably one of the most controversial comedians of all time. A man who has made a very successful career out of having a disregard for political correctness. Yet when talking to a customer about the show, he remarked that his routine was not as controversial as his routines from twenty years ago because this PC world we live in now simply can’t allow him to be and it’s true. Society has become so politically correct that those in the spotlight have to tread on eggshells. If one makes the wrong footstep it can damage their public reputation. Thanks to social media, the wrong footprints from the past can cut a celebrity’s path short. All it takes is for someone to dig up a tweet from years ago, that can be deemed as even remotely offensive for your reputation to be tarnished. This same Sunday evening when returning home from work, I logged on to Twitter to see the latest example of how social media can use one’s past to tarnish their reputation. Black Twitter went into a frenzy when it’s “detectives” dug up old tweets of UK Female Rapper Stefflon Don mocking dark skinned women. These tweets dated back to 2013. An era in which one could tweet as recklessly as they wanted to and no one would bat an eyelid. 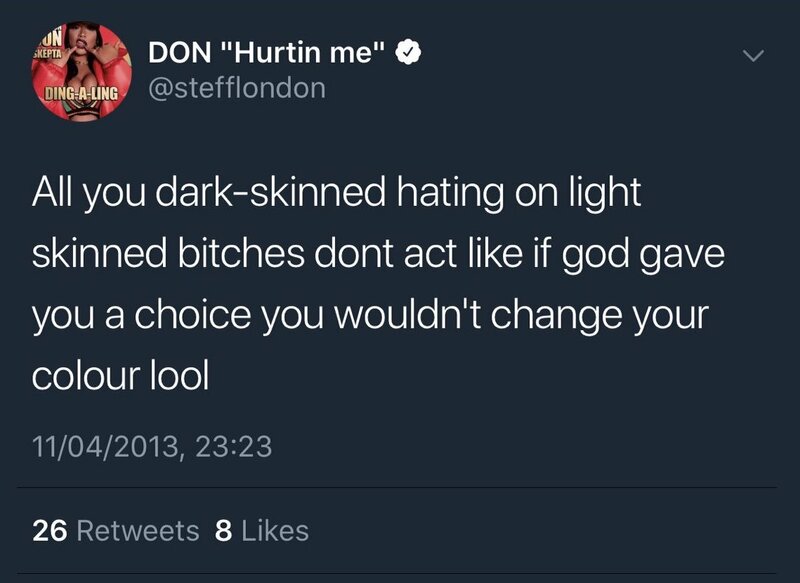 In response, to the controversy, Stefflon Don denied that she herself had made those tweets and in a very “I can’t be racist, I have black friends”-esque manner defended herself by showing more recent posts of her showing love to dark-skinned women. Now do I personally think she handled the issue correctly? No. Simply because of the underlying issue at hand. Her tweets reflect a toxic attitude that has been an issue in the black community for hundreds of years if not longer: colourism. For years dark skinned blacks have been deemed as less worthy/desirable than their lighter skinned counter parts. As far back as the days of American slave owners keeping dark skinned slaves on the field and having light skinned slaves do the easier work in the house hold. To the days of being teased for being “blick” in secondary school and all the “buff” kids being light skinned. Colourism is still a major issue within our community and no one is effected by it more than dark skinned women. So for that I do believe that Steff should have handled the situation differently and apologised to her dark skinned sisters for those tweets whether she made them or not. On the flip side I see why she has chosen not to. Over the past year or two we’ve seen celebrities or those with huge followings on social media, have guns held to their heads and forced to apologise for “offensive” tweets they made years ago. We saw it with Stormzy last year regarding the “F” word. Sometime last year a spring of old tweets filled with derogatory remarks towards black women by prominent male UK Black Twitter users, were brought to the forefront. Many of these accounts were even disabled. The message was clear: NOBODY IS SAFE. Now do not get me wrong. These tweets were disgusting however it is obvious that the intent of these “twitter detectives” is not to bring justice. The intent is to simply shut down and hinder the progress of these celebrities/influencers and that is equally as toxic as the old tweets themselves in my opinion. As unpopular as it may be to say this: people CAN and sometimes DO change. The values and attitudes of one can evolve over time through life experiences, being educated or simple just plain old maturity. Whether that takes years or even a few months, people can change and “grow”. So to forever define and someone to hurtful things they said years ago is simply unfair. Imagine if you had to answer for every single offensive thing you have ever said in your lifetime. Having to answer to COMPLETE STRANGERS. I’m sure the PC Police would have us all in cuffs (including themselves). So with that said I do believe and hope that Stefflon apologises for her tweets whether she made them or not. Colourism has got to go. It does nothing but divide and hold back our people and there is no place for it in 2018. On the flip side I do understand if she chooses not to. Especially if she did not make those tweets as she claims to be the case. Let me know your thoughts, while I go back through my twitter account to make sure the PC Police have nothing to incriminate me with in the future when I blow up. [A Rant] Stop attacking the Grammy’s for the wrong thing!